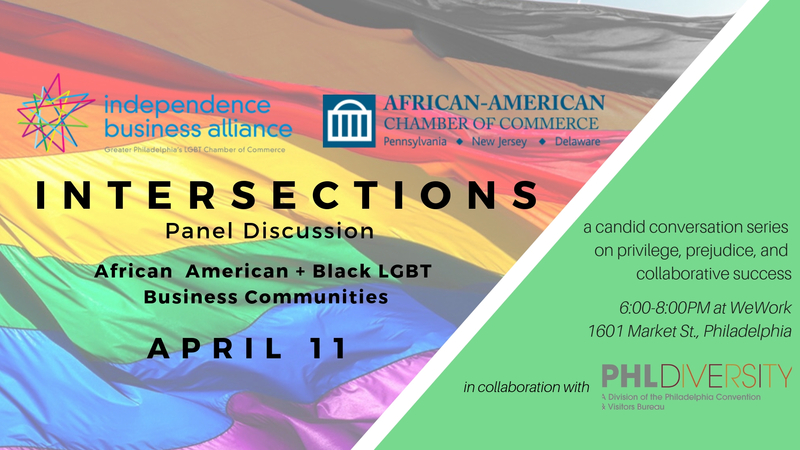 The IBA, in partnership with PHLDiversity & AACC, invites you for a candid conversation exploring the intersection of LGBT, African American, Black, and business communities. Join us as we explore the impact that African American, Black, and LGBT professionals can have in the workplace, in entrepreneurship, taking our seat at the table, and our ability to change the narrative of under representation. Panelists TBA! You won't want to miss this honest dialogue amongst community and business leaders. About the venue: WeWork is a community for creators. We transform buildings into beautiful, collaborative workspaces and provide the infrastructure, services, events and technology so our members can focus on doing what they love. WeWork currently has 287 locations in 77 cities across the world with over 268,000 members. Book a tour atwework.com now! Personal information is collected on this website only when you voluntarily submit it by, for example, registering for the website, or updating your user profile. We respect the privacy of your personal information. Any collected personal information will not be shared, sold, or disclosed to any person or party outside of IBA Members and Corporate Partners, and will only be used to communicate news, events, and other services with you. Unless otherwise specified, event registrations are non-refundable.